Scissors Paper Pen: Hello New Toy! 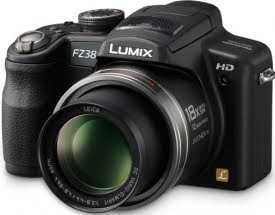 Here is my new Panasonic Lumix DMC FZ38.....winging it's way to me right now! Just in time for our upcoming big camping adventure to SA! Holy gazoly.....choosing a new camera is such a dilemma! This website was a huge help tho....Photography Blog.....each camera is reviewed in detail and the best part is it compares them to their closet rivals. The prices given are in US dollars but I simply did a search with one of the many price comparison sites on the web and ended up only paying half the rrp! Lucky you! My camera is dying and is really playing up heaps now.....let me know how this one goes! turning so green here. lucky you!! !